Grim and Me: Building a Legacy, Moment by Moment | Use Your Words | Kids VT - small people, big ideas! My kids wake up and eat breakfast, go to school and come home, and eat dinner and go to bed, just like kids in ordinary homes. But we aren't an ordinary household. Two and a half years ago, the Grim Reaper came to live with us. Some days, when the kids are at school and my husband works, Grim and I have long, in-depth conversations about how living with death on your doorstep can impact your life. Other days I don't talk to him at all. Before Grim showed up, I was crushing motherhood. I worked full-time as a social worker, then dropped down to part-time when my youngest was 3. I attended playgroups, enrolled my kids in preschool dance classes and volunteered at the elementary school. In 2014, I was even a gestational surrogate for a dear friend of mine. The summer of 2015 was the best summer of my life. My kids were independent enough that I could finish a conversation with other adults, but they still thought I was the coolest person they knew. I was finished with childbearing and focused on getting back "inside my body" since I wouldn't have to endure pregnancy and milk production again. I was becoming more familiar and comfortable with the skin I was in. So when I detected some pimples on my breast that wouldn't go away, I asked a doctor about them. 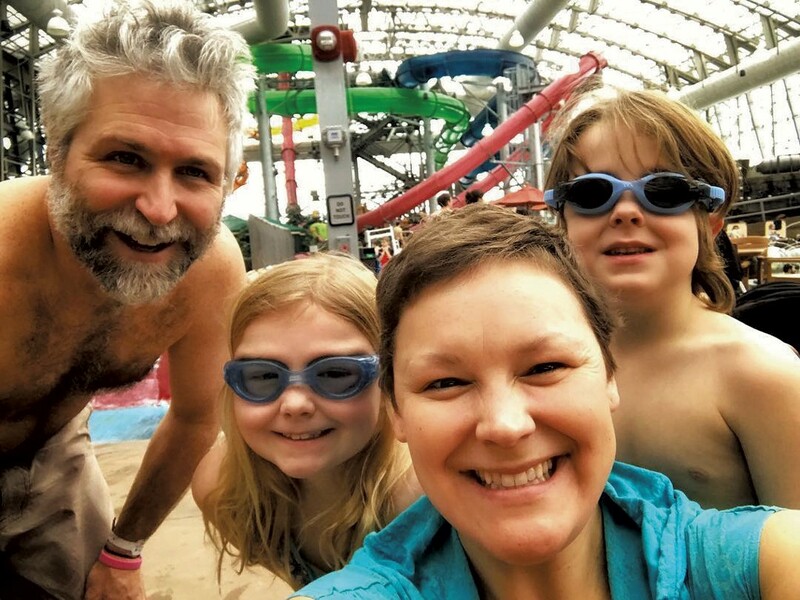 A few weeks later, much to my shock and awe, I was diagnosed with stage IV breast cancer, or metastatic breast cancer (MBC). For those who don't know, MBC is incurable. I know what you're thinking. Your sister's neighbor's daughter had breast cancer four times and she beat it every time, and you know I can too. Don't. Just don't. Listen. MBC does not have a cure yet. People with MBC may get to a point where they have "No Evidence Of Disease," but still, they will not be considered cured. I don't make up these rules. I just know them now because I, like so many others, have MBC. The doctors have told me that the plan is to keep the disease at bay for as long as possible, but that eventually it will take my life. My brutal education started on September 29th, 2015. I heard a knock on my door. And standing on my doorstep was the Grim Reaper. He offered me my likely cause of death. Cancer. I invited him in and offered him some tea, as if, through a conversation over hot beverages, I could make a deal with the devil. I tried to reason with him. "I'm just 35. My kids are 4 and 7," I said. "Shouldn't I be able to see them grow?" "I can't give you any guarantees," he replied. "But my husband," I pleaded, "he doesn't even know that when you run out of dish soap, you have to go buy more dish soap. How will he run a household without me?" "There is still some time for you to teach him these things," Grim said, "but he'll eventually figure that one out." "But Grim," I said, "I'm a good person, how can this be?" There is no time line for me. No expiration date. Hell, I could live for the next 20 years. Maybe I'll even get to meet my grandchildren. I could see my kids fall in love and get married. If I'm lucky, I'll get to comfort them when they have their first breakup. Or embarrass them as I drop them off at middle school on their first day. There is no time line, but the American Cancer Society states that women with MBC have a 5-year relative survival rate of 22 percent. I'm halfway there. The moments I am with my kids, and even when I'm not, I'm painfully aware that our memories outlive our temporary and fragile bodies. I wonder, even in this moment, typing away at my computer while my daughter sits across the table working on a craft project, Will this be one of the moments that she thinks about when I'm gone? What will she remember? This wonder about what my kids will carry with them is constant. I've become obsessed with my "legacy" and making memories with them. Snorkeling in the cenotes in Mexico, playing Heads Up! while waiting in the customs line for hours, bridesmaid dress shopping with my daughter for my sister's wedding, snuggling while watching The Great British Bake Off, singing Brandi Carlile while making dinner; all of these are opportunities to assist in solidifying their idea of me as a mom. This could be it. But there is so much more to show them. So many more memories we could make. How can I fit it all in before I'm gone? Did I hug them enough when they hurt themselves? Was I too hard on them about their sugar intake? Is it going to cause a complex? This is mental chatter that all parents grapple with, but these passing thoughts seem heavier now than they did before my diagnosis. When my kids are adults and spend their therapy sessions wondering why they won't let anyone hug them when they're hurt — and then realize it was all because their mom told them to "get up and brush it off" — I won't be there to defend myself. I'll be dead. For now, I've mastered the art of living with love and intention. I let my kids stay up late. I invite my friends over for coffee and long chats on my couch. Self-love, yoga and spa treatments have become priorities. The Grim Reaper sits at our table, but we don't let him rule our lives. He isn't in a rush, but he is a constant reminder that time is not a luxury I can count on. So I get up from the table, put the plates in the dishwasher, and read my kids bedtime stories. The moment is all I can truly be sure of. So that's where I stay.